Same beach, different waves. Why? Here is a puzzle for you. Walking along a beach, first, the waves looked like this: One wave breaking at a time. That’s the situation you also see in the foreground of the picture below, while in the background, a little further down the beach, something else starts happening. 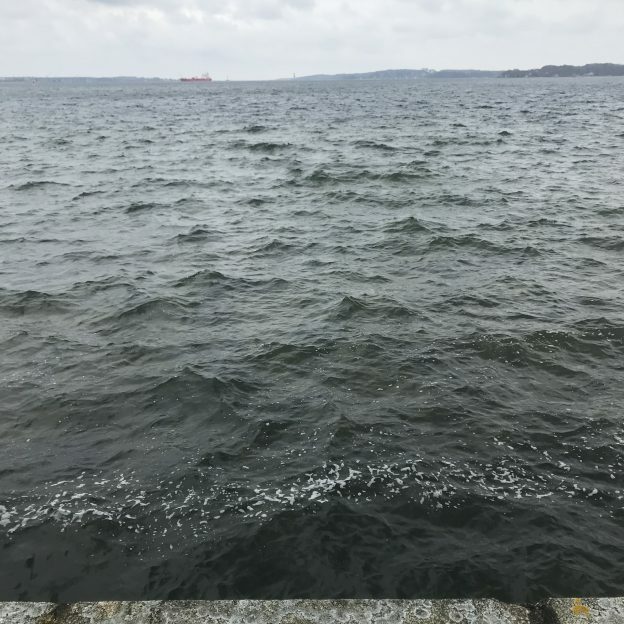 If we look closely at that situation (shown in the picture below), there are several waves breaking at the same time, one behind the other. And it isn’t just coincidence, it keeps happening throughout hundreds of pictures I took that windy Sunday. Why is that? 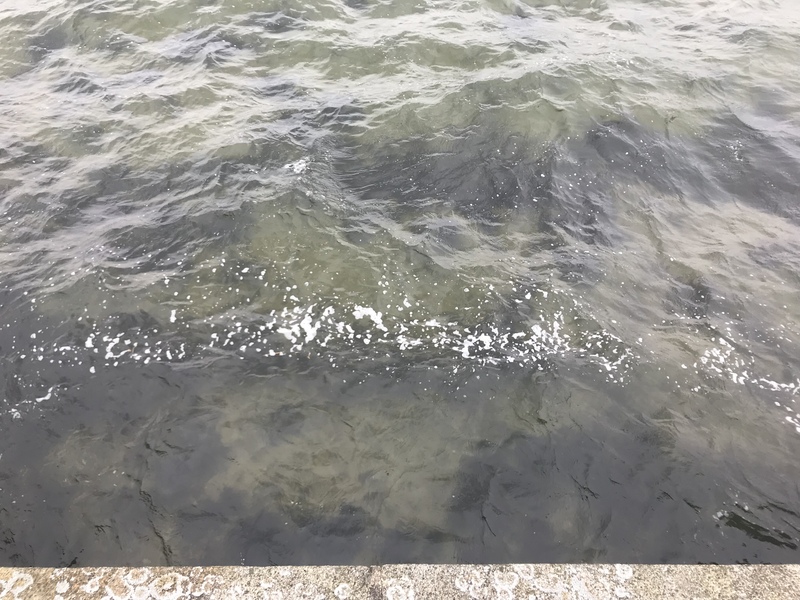 I think (and this theory would be easy enough to test if the water was warmer or if I wasn’t such a sissy) that the slope of the beach is just different on either side of this little jetty or whatever it is. 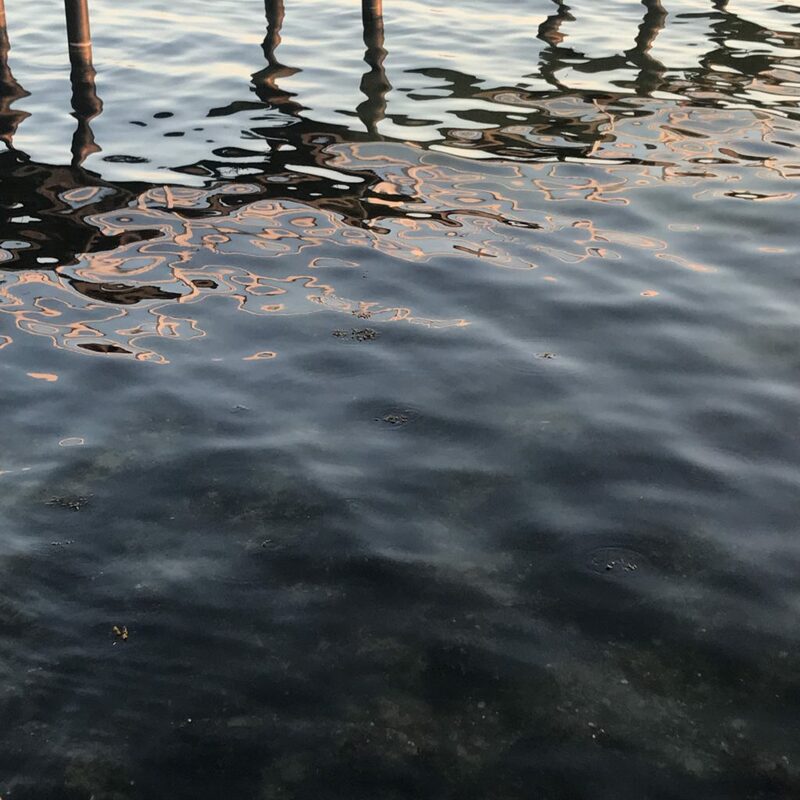 The shallower the slope, the earlier waves of the same wavelength can “feel” the sea floor, or the shorter waves have to be to “feel” the sea floor at the same distance from the water line. 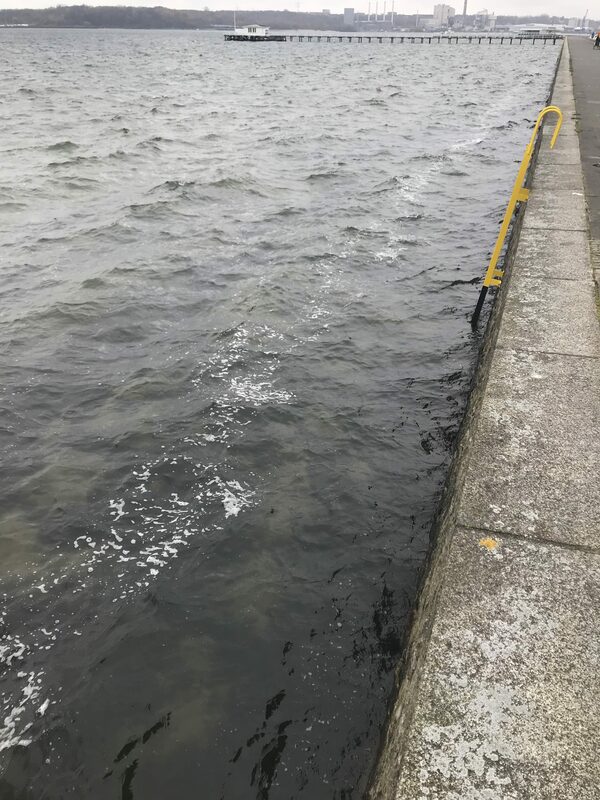 So I think the slope on the left of the jetty is shallower than on the right, making the incoming wave field that is the same on either side (I’m assuming, but give me a good reason for why it shouldn’t be?) behave differently. 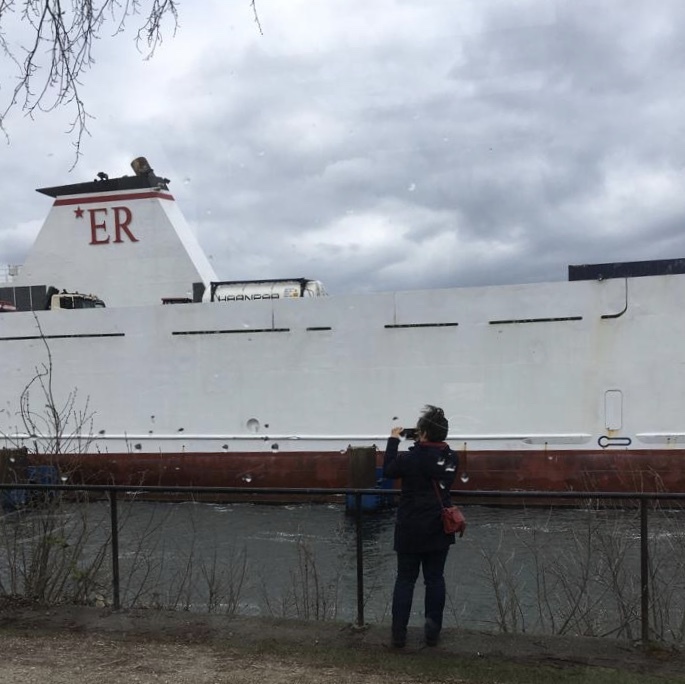 But here is a “before” pic from when I was still thinking I would be writing a blog post about the ship going through the locks. Isn’t the seagull hilarious, posing like that? 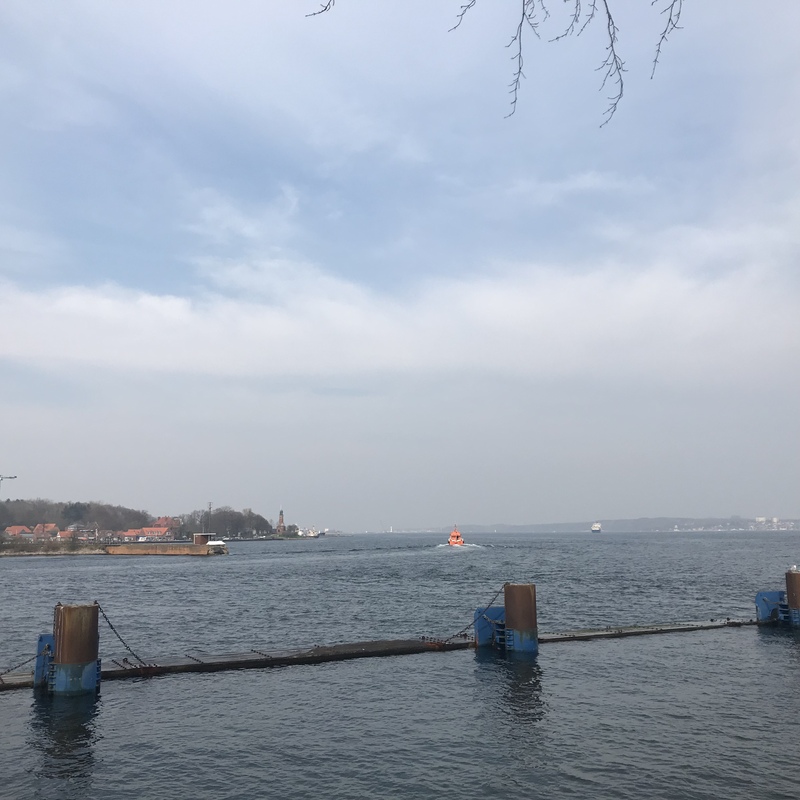 This entry was posted in wave watching and tagged beach, breaking waves, Kiel fjord, slope, Strande, wave breaking, wave watching on April 18, 2019 by mglessmer. 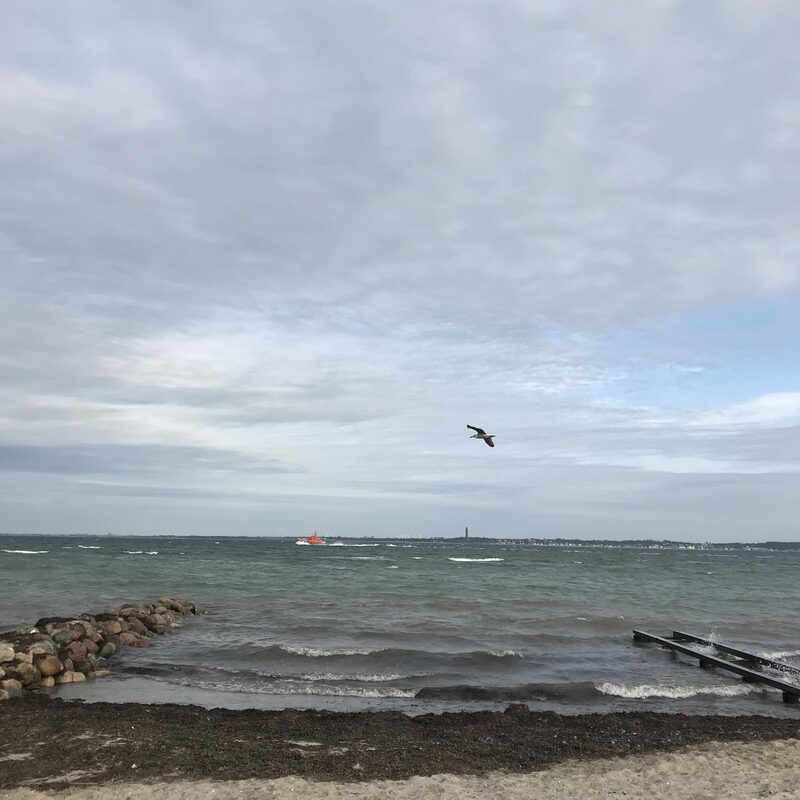 You see them a lot here on Kiel fjord when it’s windy, and this is what they looked like last Saturday: Foam stripes than run parallel to the coast for as long as the coast is a sea wall (or at least something fairly straight). What’s going on there? 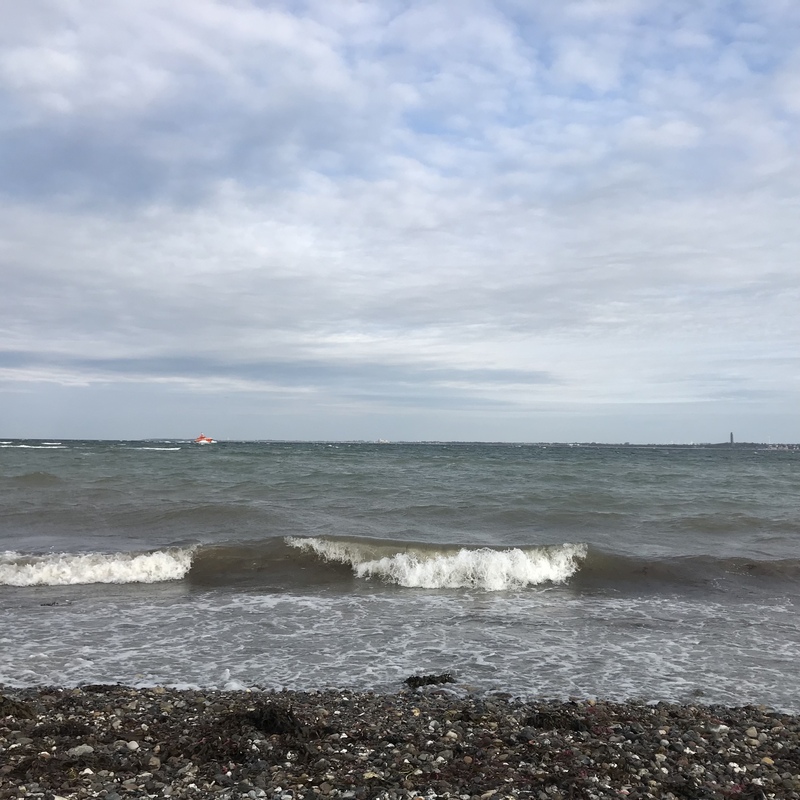 I have seen them over and over again, and the most common explanation that people have is Langmuir circulation, which i don’t actually think it is (and I show you some evidence for why I don’t think they are Langmuir circulation in this blog post). The stripes we see here are nowhere near parallel to the wind direction. Last Saturday, they were pretty much perpendicular. So I think there is just a surface convergence there, parallel to the coast, probably related to the typical wavelength. So the question should probably be: Why is there a convergence parallel to the coast independent of the wind direction? What do you think? 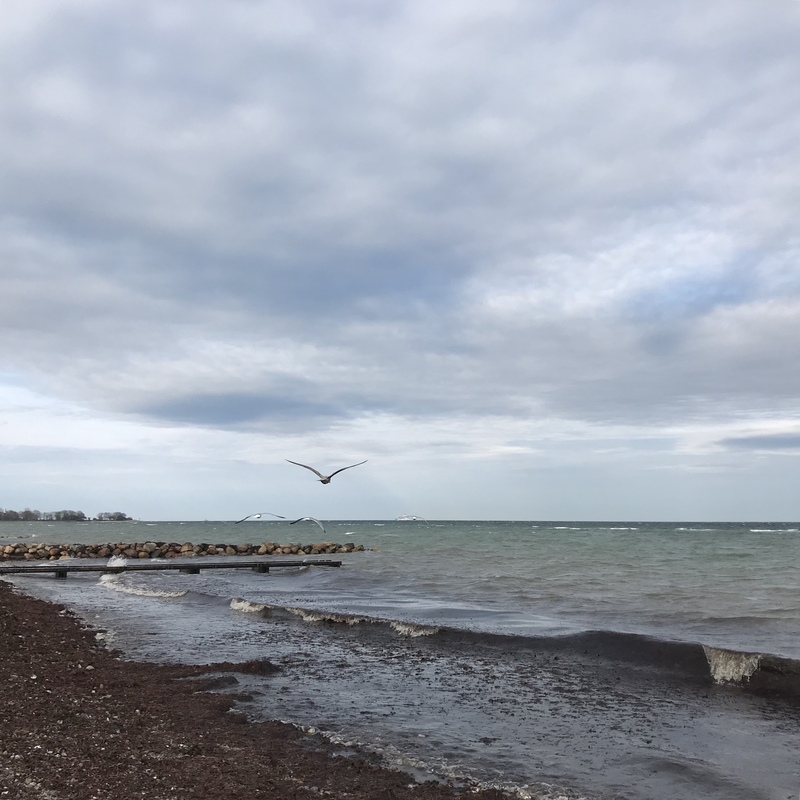 This entry was posted in Uncategorized on April 17, 2019 by mglessmer. 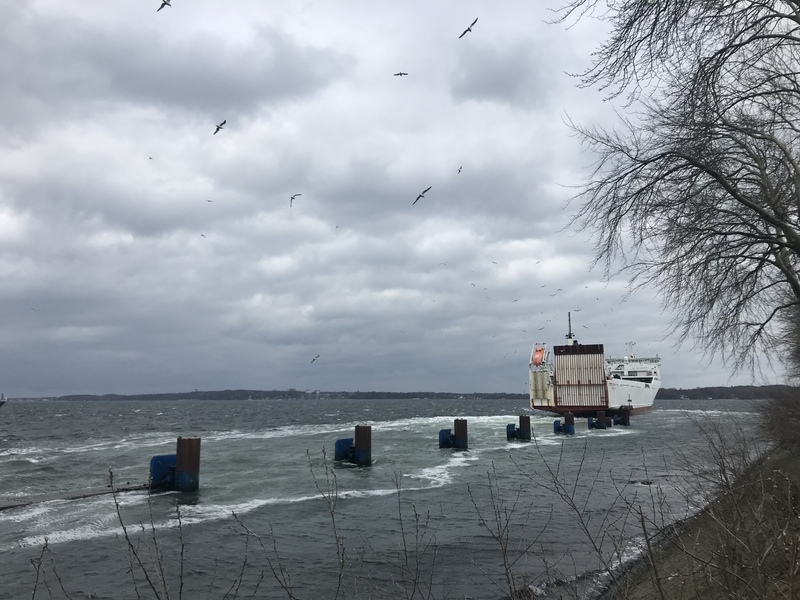 Occasionally working from home is awesome for many reasons, but mainly because I can use the time usually spent on commuting on … wait for it … wave watching. With my cup of coffee so I can warm up my fingers in between taking tons of pictures. But I just love it. 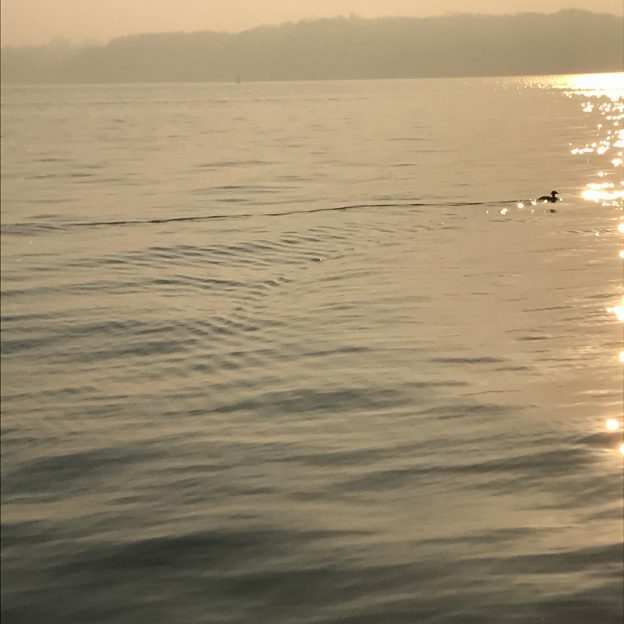 See below how the seagull is making waves where it is swimming, but is surrounded by a much larger circle, too, that it started when it landed on the water? And if you look closely, you see the ring waves radiating from where the pylons disturb the water surface as waves go by. I absolutely love to watch how the much longer waves can cause these ring waves with such a short wave length, and how they are deformed again by the waves that caused them. I can look at this for a long time without getting bored, it is so calming to me! Especially in the early morning light. But anyway, time to start working. Have a great day everybody! This entry was posted in wave watching and tagged interaction, reflection, reflections, wave watching on April 17, 2019 by mglessmer. 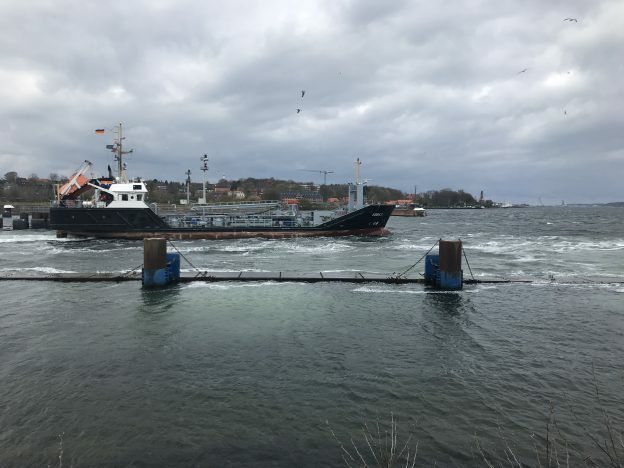 Windy days at Holtenau locks: Now THAT’s a turbulent wake! Now that the weather is nice and sunny again, here is what it looked like only last Saturday. It wasn’t even really stormy, but windy enough so that the ships leaving the locks at Kiel Holtenau were working a lot harder than usual. Especially difficult when you are almost empty and then there is a lot of wind! See that wake? Right behind the ship you see above, there was a second ship leaving the locks. 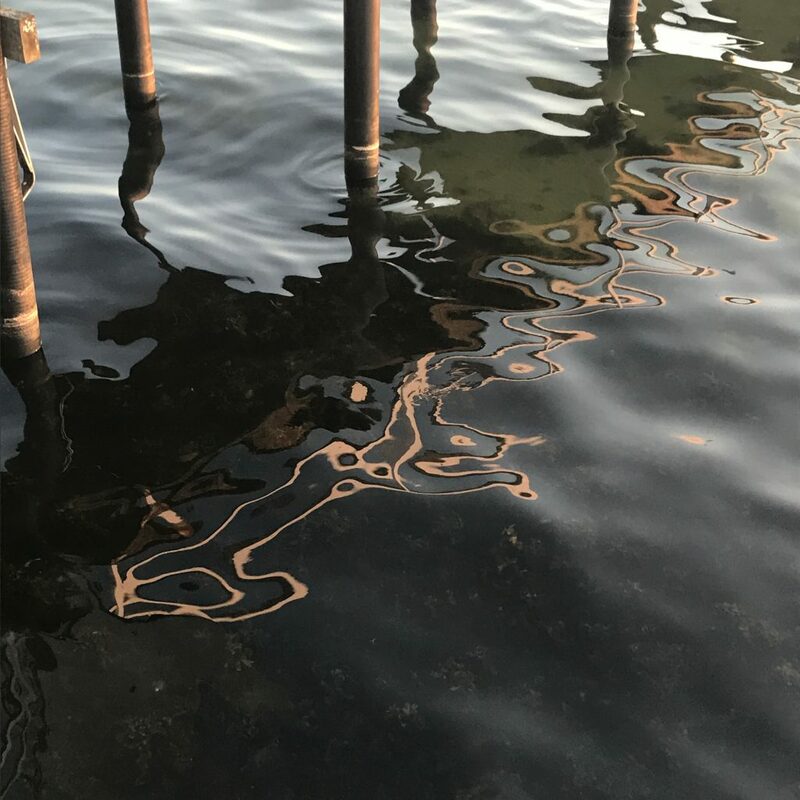 See how milky the water looks where the first ship went from all the air bubbles that were pushed under water by the ship’s propeller? You can even see some of that water spreading underneath that floating barrier in the foreground! And see the difference between the waves on the upwind side of the ship and the downwind side? 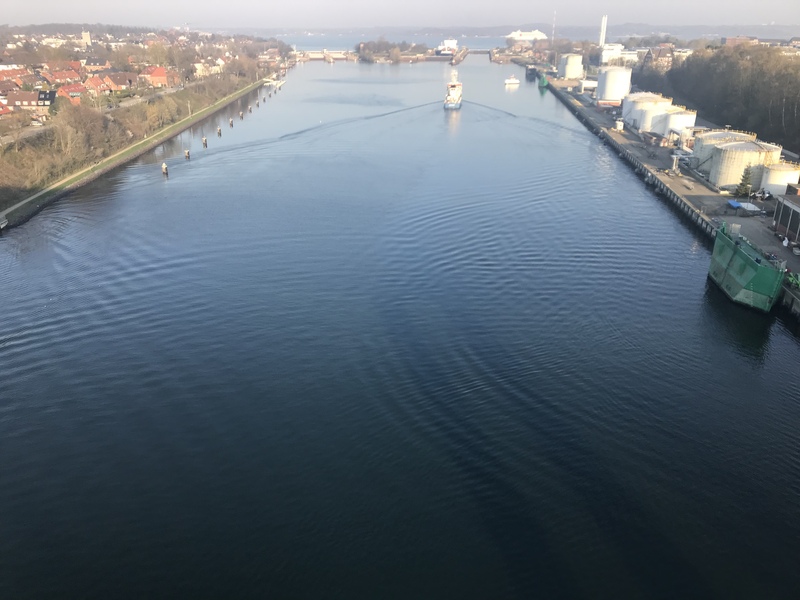 This entry was posted in wave watching and tagged Holtenau, Kiel, Kiel canal, Kiel fjord, lock, ship, ship-generated waves, turbulence, wake, wakes on April 16, 2019 by mglessmer. 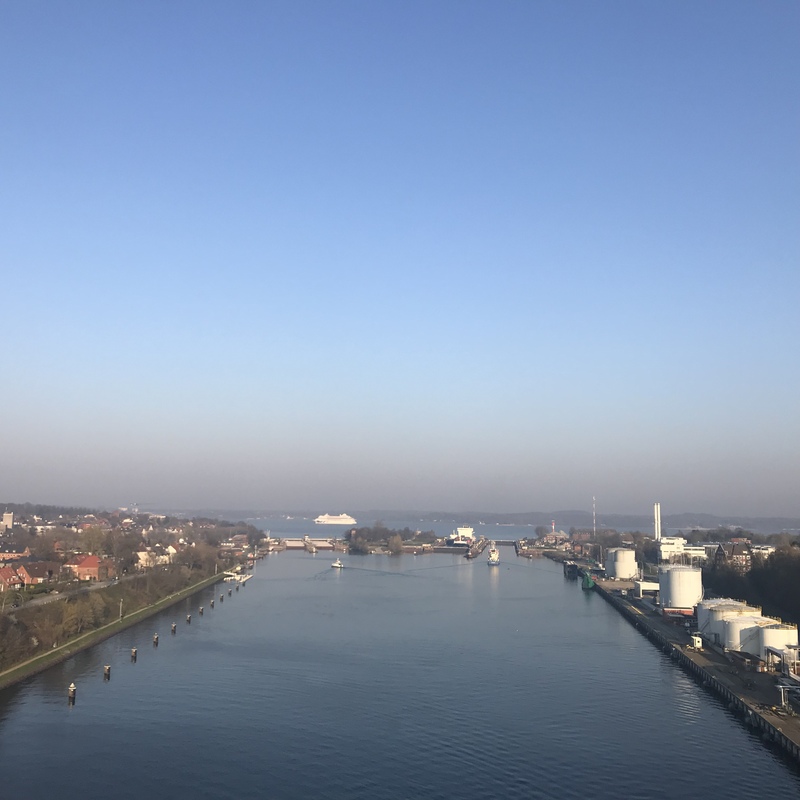 On Sunday, I set out to see a large cruise liner go through the locks at Kiel Holtenau. 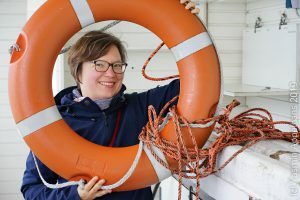 What happened, though, was that a ship with a smiley painted on its deck came first. Do you see the two shadows to the right of the ship, the left one aligning with the one side of the wake’s V? That’s the pillars the bridge is resting on. 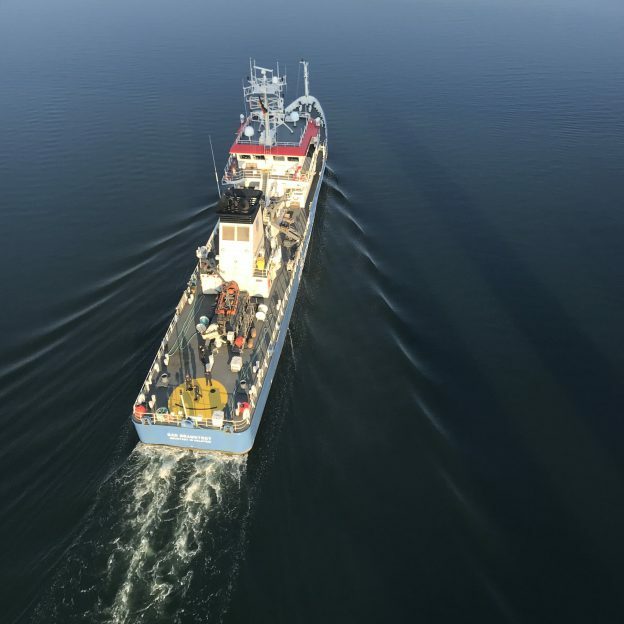 This ship has a very interesting wake, since it consists of several Vs. Not quite sure why. Also, it seems to be driving in a very non-straight line, judging by its turbulent wake. But watch what happens when the wake hits the sides of the canal. The green thingy interrupts the straight line of the shore and creates these beautiful ring waves! A little while later they have spread half way across the channel, while on the other side, the wake is just reflected on the shore. It looks funny how the reflections are so asymmetrical relative to the ship, but of course the ship isn’t driving in the middle of the channel, so they have to be. 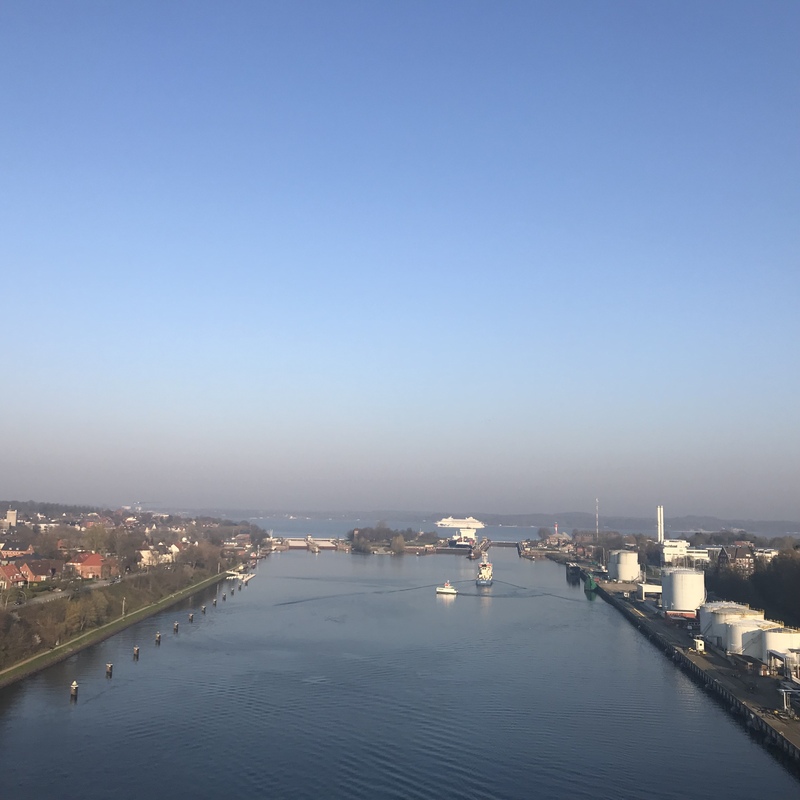 And on the other side of Kiel fjord? Yep, the cruise liner speeding past the locks. 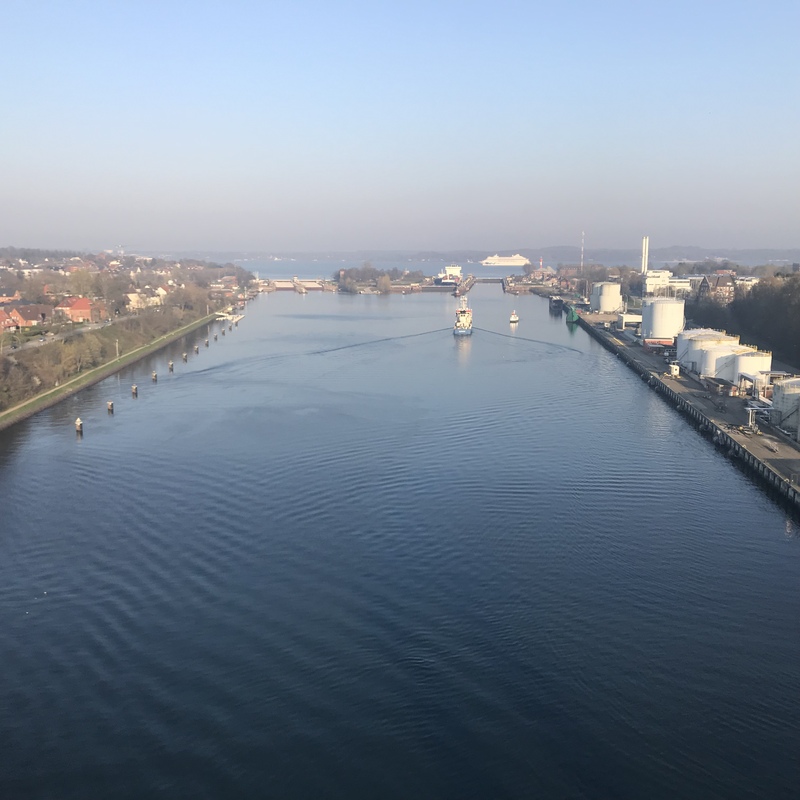 Clearly they decided to not take the shortcut through Kiel canal. 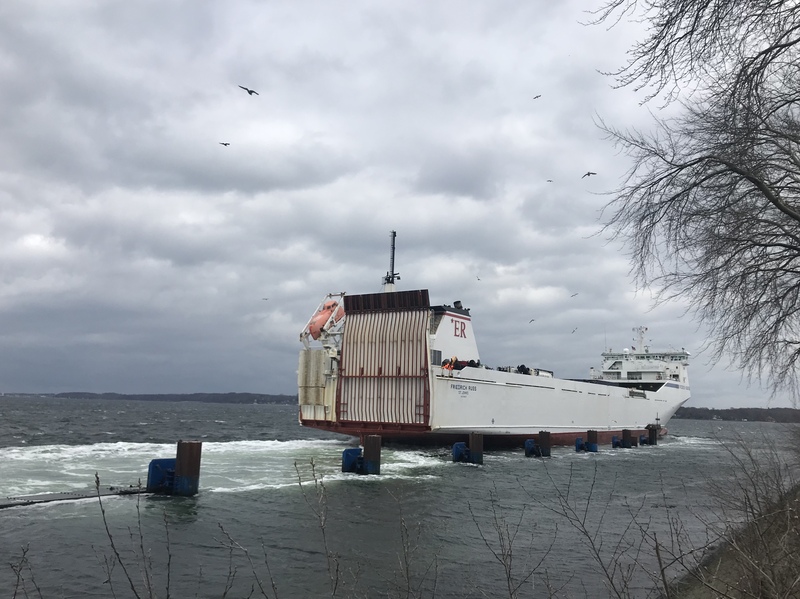 And now the small ferry is starting to cross. And in the background: The cruise liner! 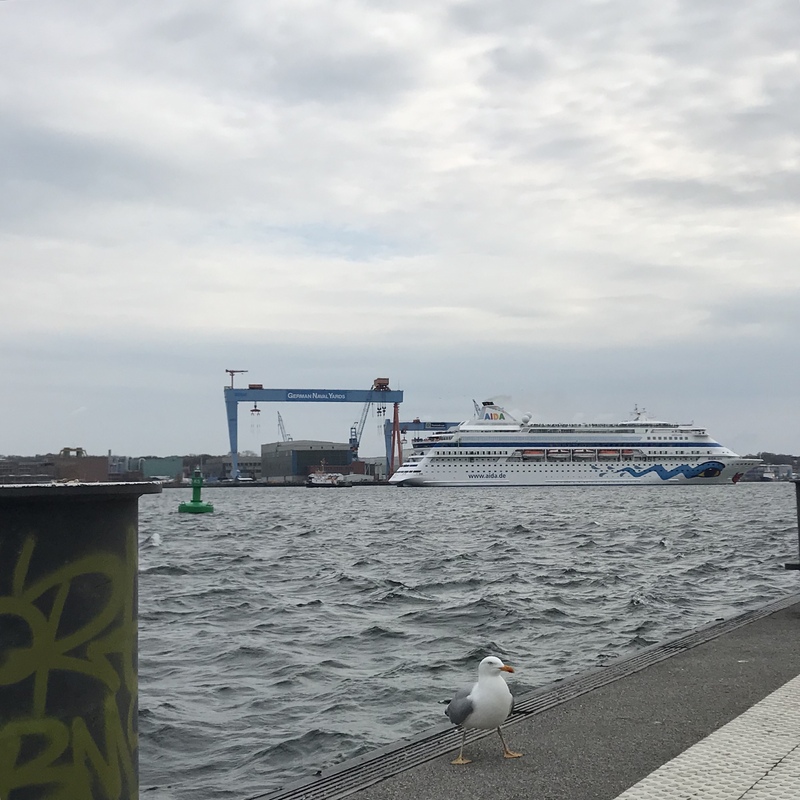 I realize the earlier pictures in this posts were a lot nicer than these, but look how funny: Above you see the small ferry going around the larger ship, and the wake tracking where it went on its turn. And below, it has turned into a V! Waves are funny. 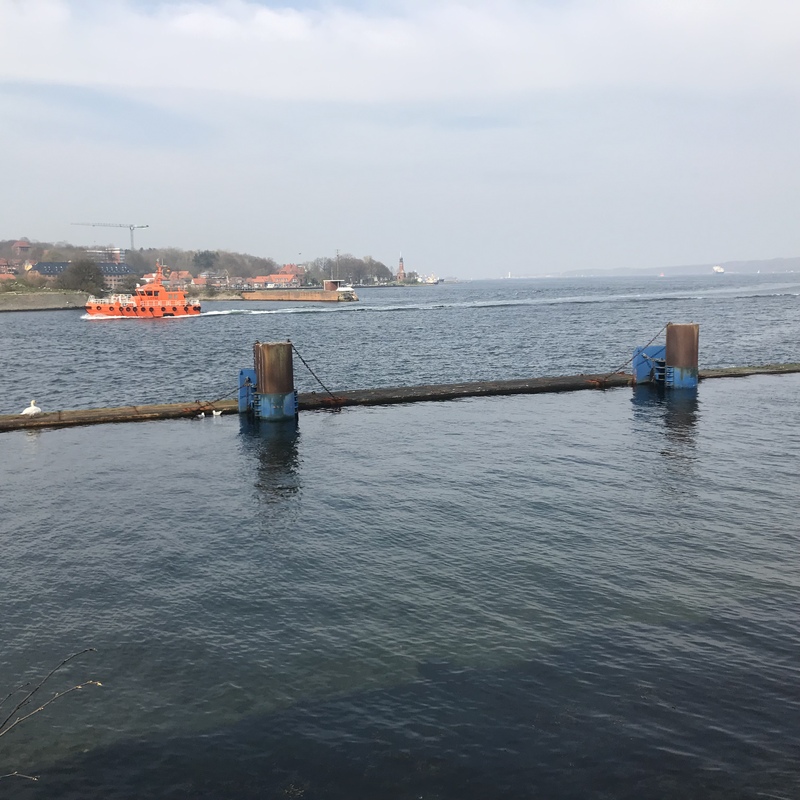 This entry was posted in wave watching and tagged Holtenau, Kiel canal, lock, ship-generated waves, wake, wakes on April 10, 2019 by mglessmer. When it’s all foggy and there are hardly any waves, sometimes help comes from the most unexpected places. 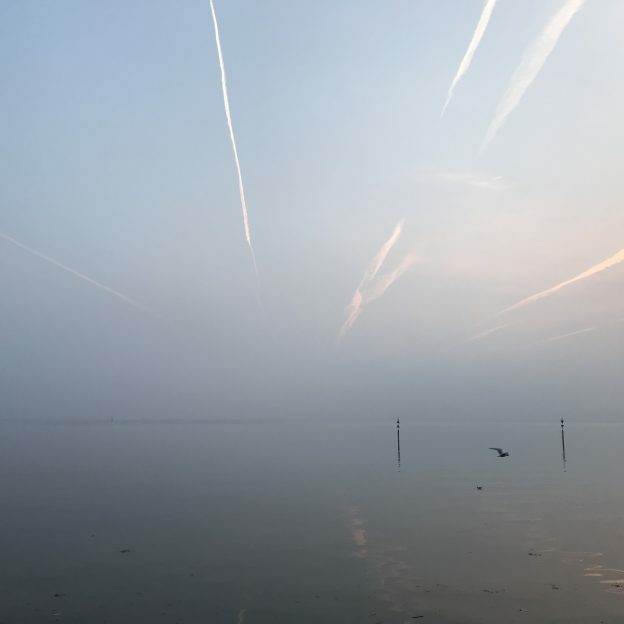 Today: condensation trails that are reflected on the water! Isn’t it interesting to see how depending on the angle of the trails waves show up a lot or hardly at all? The condensation trail on the right really looks like a snake that fell into an ants’ nest, whereas the one on the left is wriggling calmly and composedly. 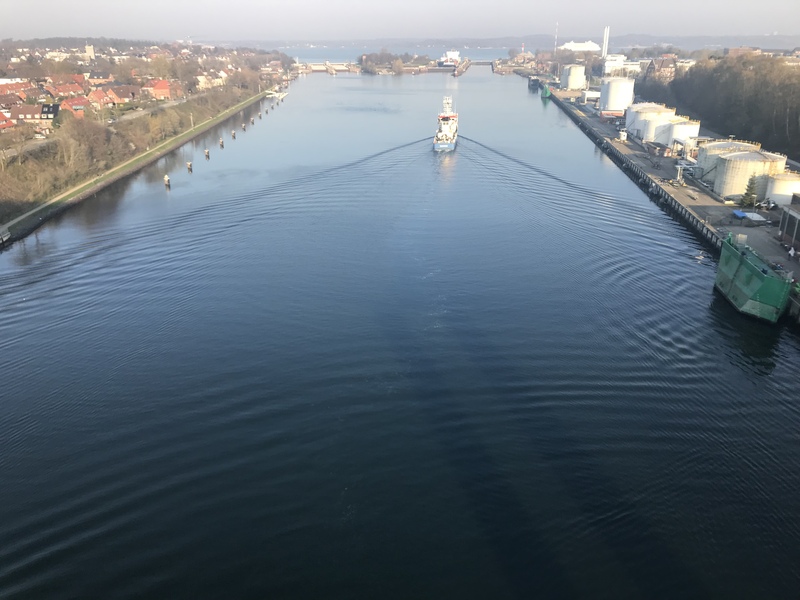 This entry was posted in wave watching and tagged condensation trail, Kiel fjord on April 9, 2019 by mglessmer. 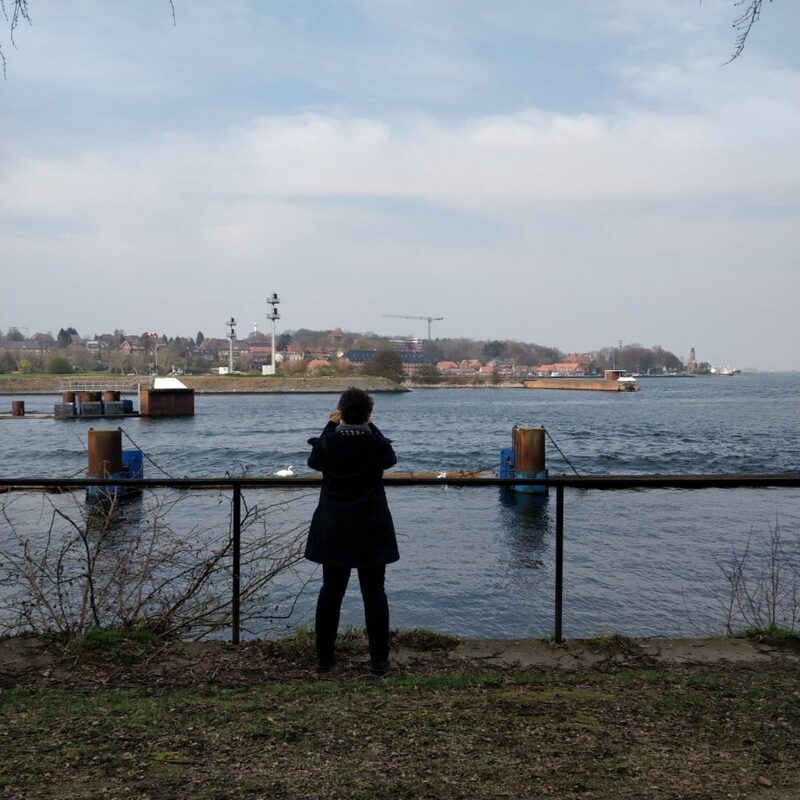 Some throwback Friday evening wave watching (at the locks at Kiel Holtenau with my friend Sara for a nice and relaxing end of the week) to start the new week. The best! First: The pilot boat going towards the locks. Unusually visible wake — they are going fast today! 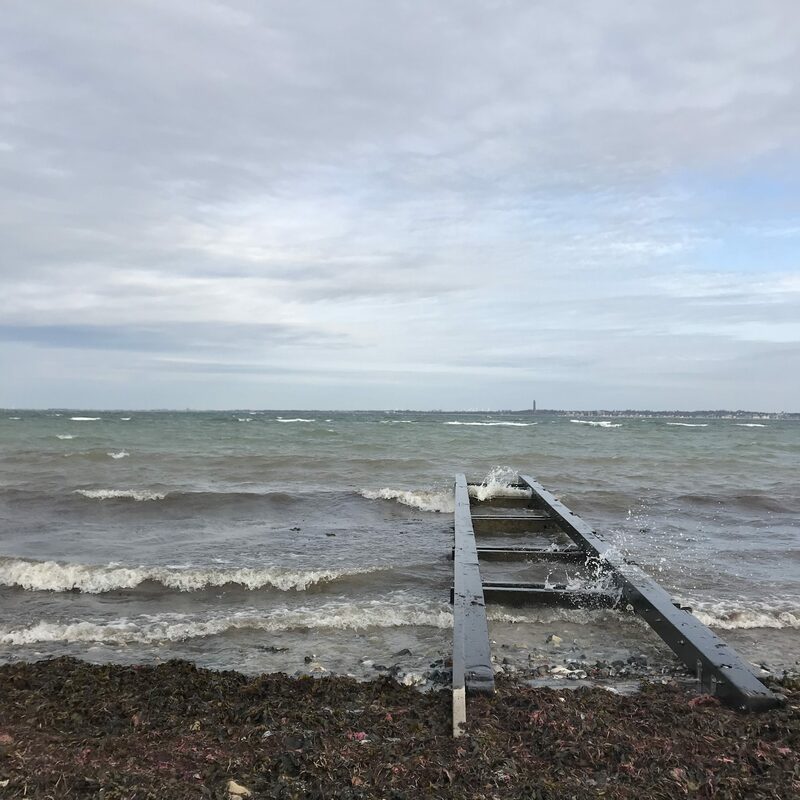 Plus an interesting sheltering of waves: The wind is coming towards us so outside of those floating pontoons are a lot larger than the ones on this side that haven’t had enough fetch to build up. Below we see the same wake: But do you see how it’s just ending on the left? That’s because the pilot boat went in behind the jetty on the far side of the fjord, and it’s only these bits of the wake that were able to propagate outside before the boat went in and the waves don’t make it out of the small channel created by the jetty. 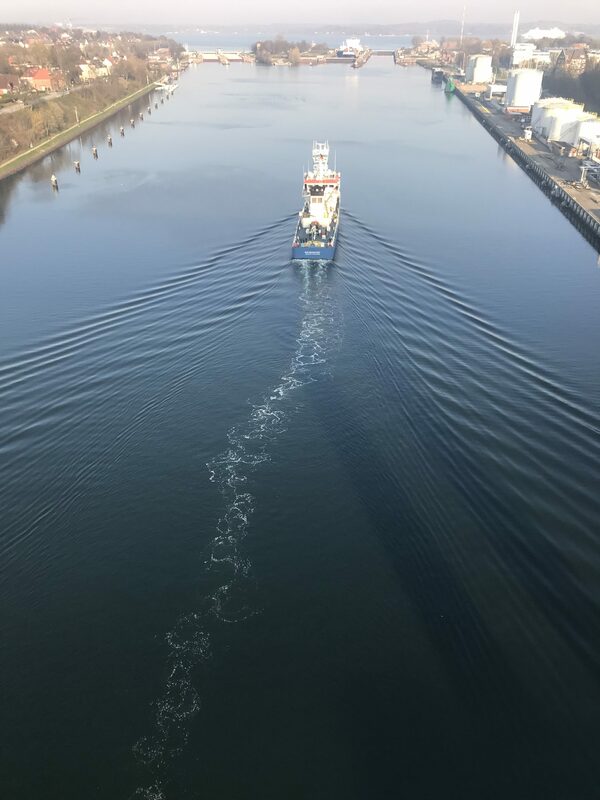 And below the pilot boat going out again in a curve: Love how you see the turbulent wake as well as the deformed V-shaped feathery wake. 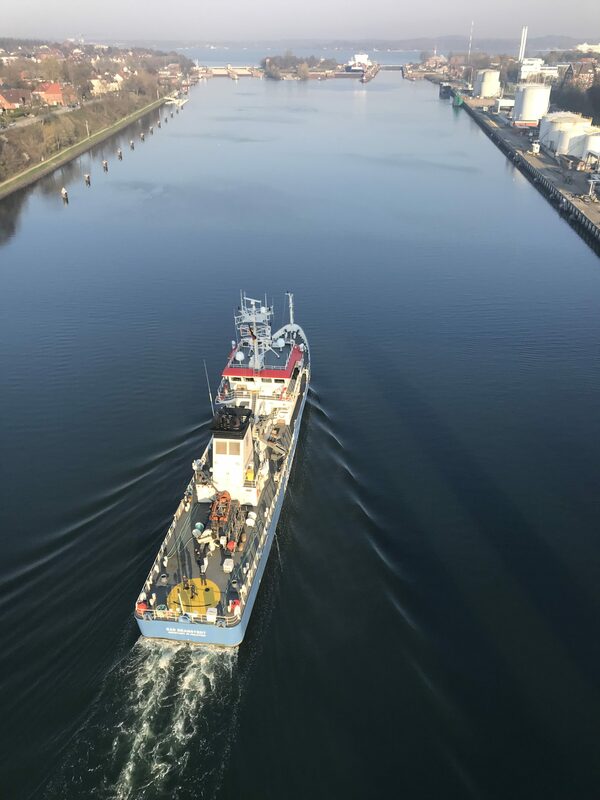 When you look from the pilot boat down on the picture, do you see the individual “feathers” of the V? Love this perspective on wakes! 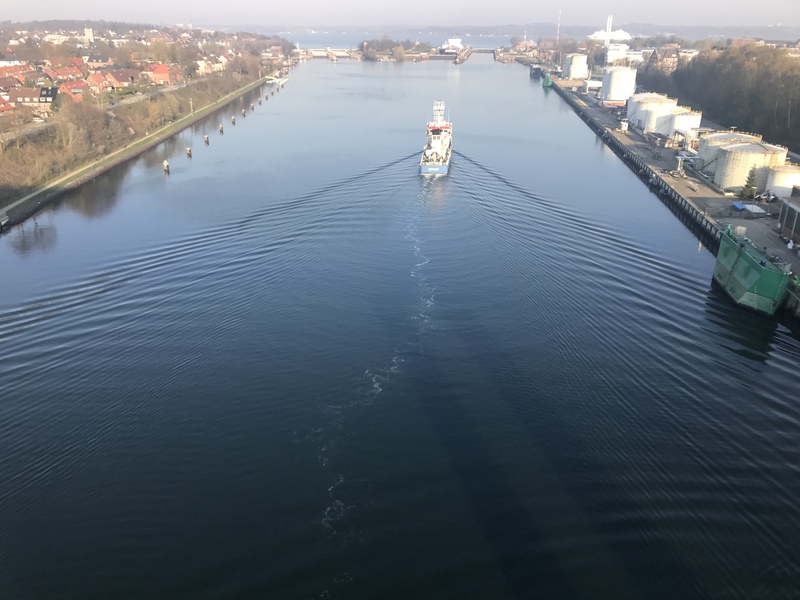 This entry was posted in wave watching and tagged fetch, Kiel canal, lee, lock, ship-generated waves, wake, wakes on April 8, 2019 by mglessmer. Do you see the half circle waves connecting the “feathers” of the feathery V-wake? 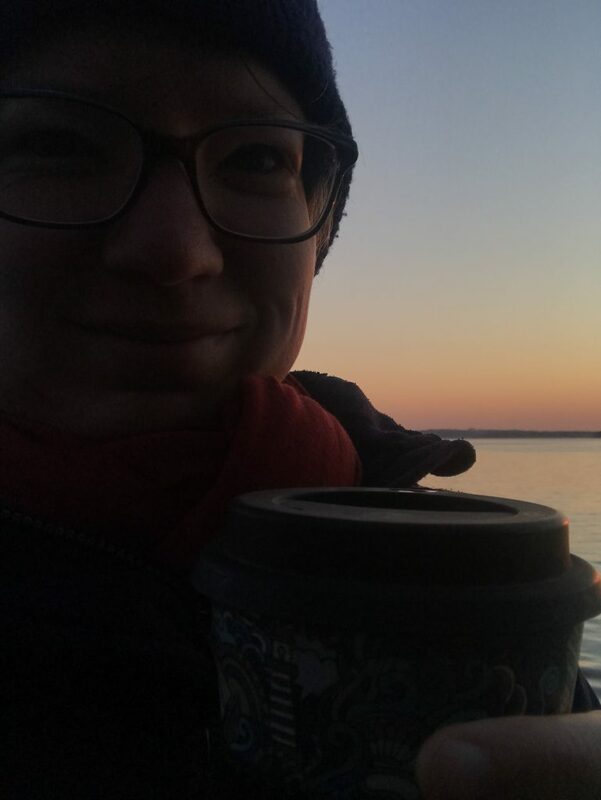 I love wave watching in the early morning, this light is just the best! 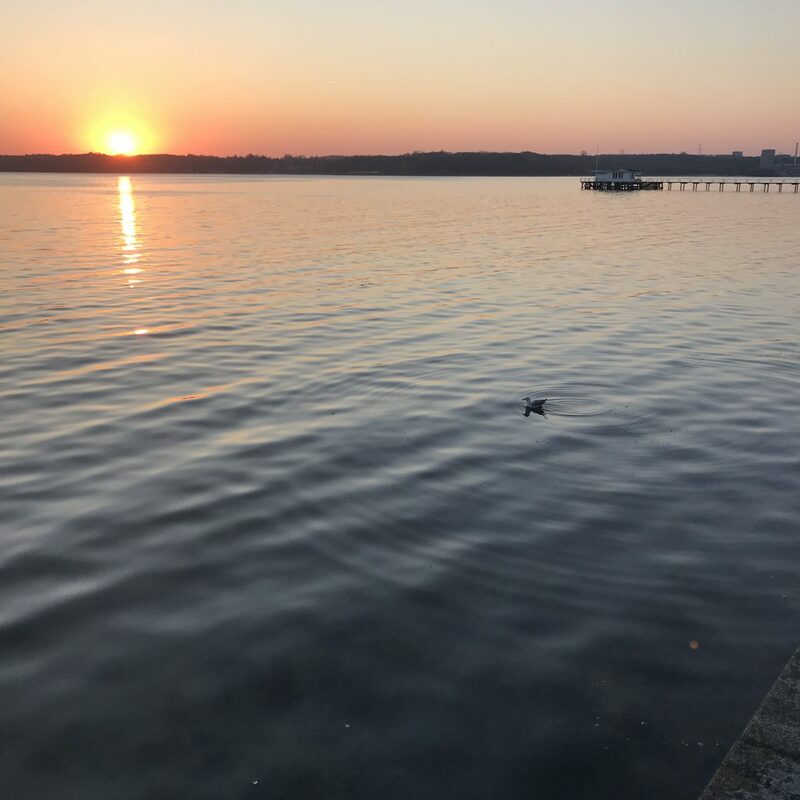 This entry was posted in wave watching and tagged birds, wake on April 7, 2019 by mglessmer. 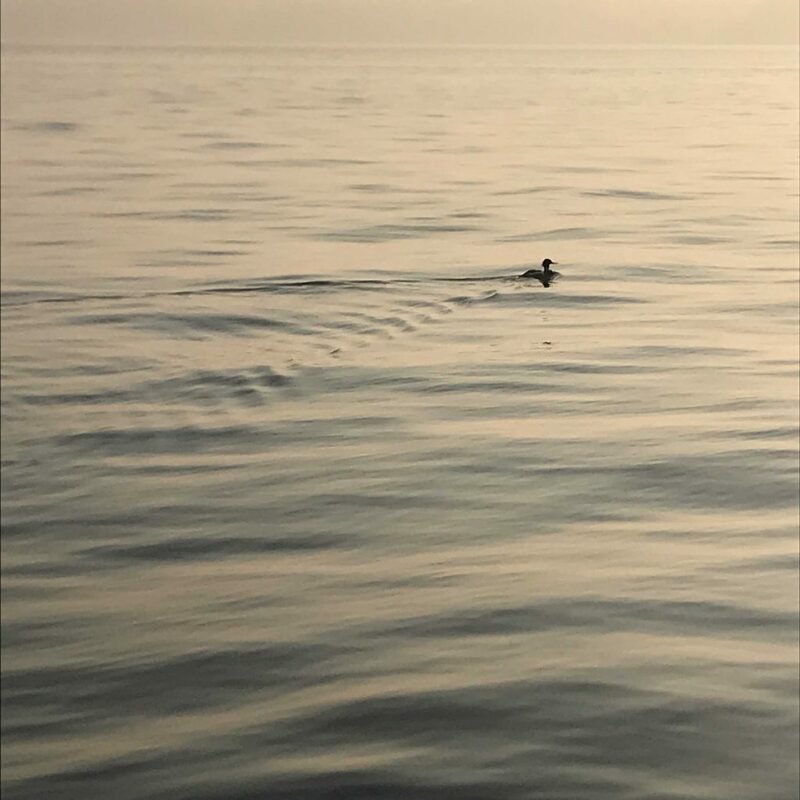 This entry was posted in #SciCommChall and tagged fascinocean on April 6, 2019 by mglessmer. A tiny waterfall, super- and subcritical flows, submerged hydraulic jump, standing waves. What more could anyone want? 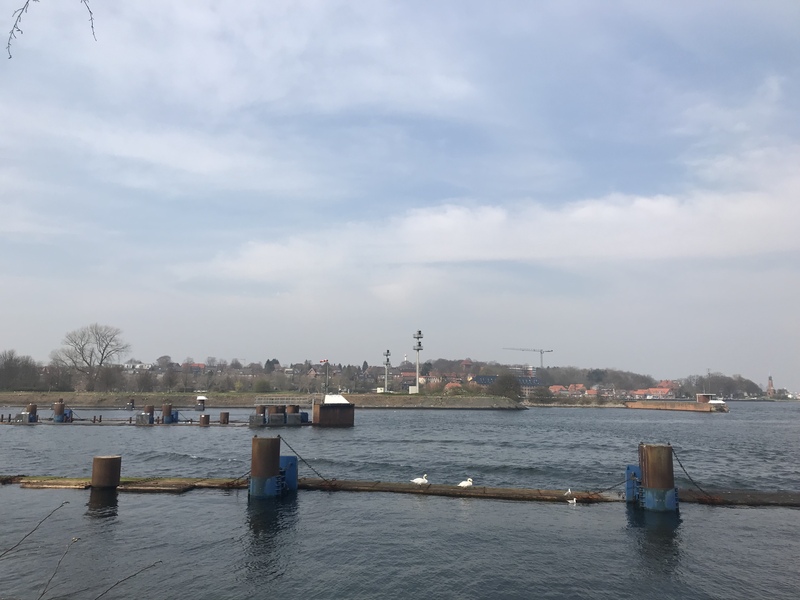 Last stop on my work trip that — apart from doing important work, obviously — brought me to Berlin for some wave watching and to Brodowin to look at beaver dams: Eberswalde. Waiting for an appointment, I sat in the sun next to this adorable little waterfall and looked at so many nice examples of phenomena. 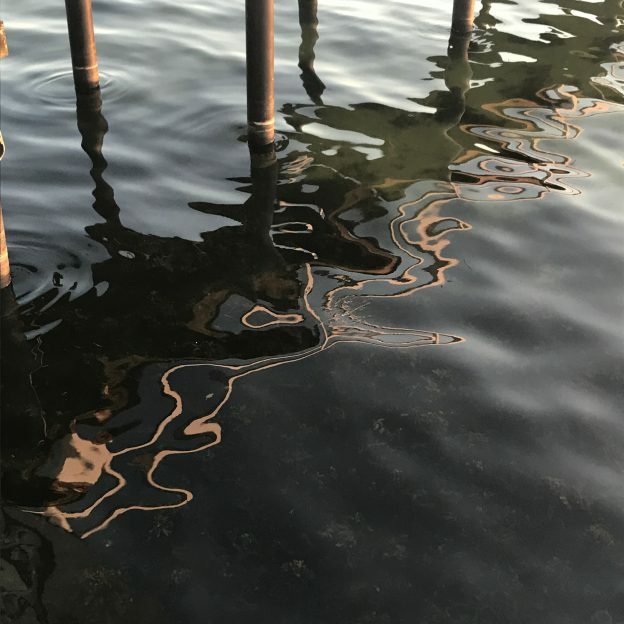 What I like best: The standing waves that you see in the reflection of the tree to the right. They do move a tiny little bit back and forth, but overall stay pretty much in place. 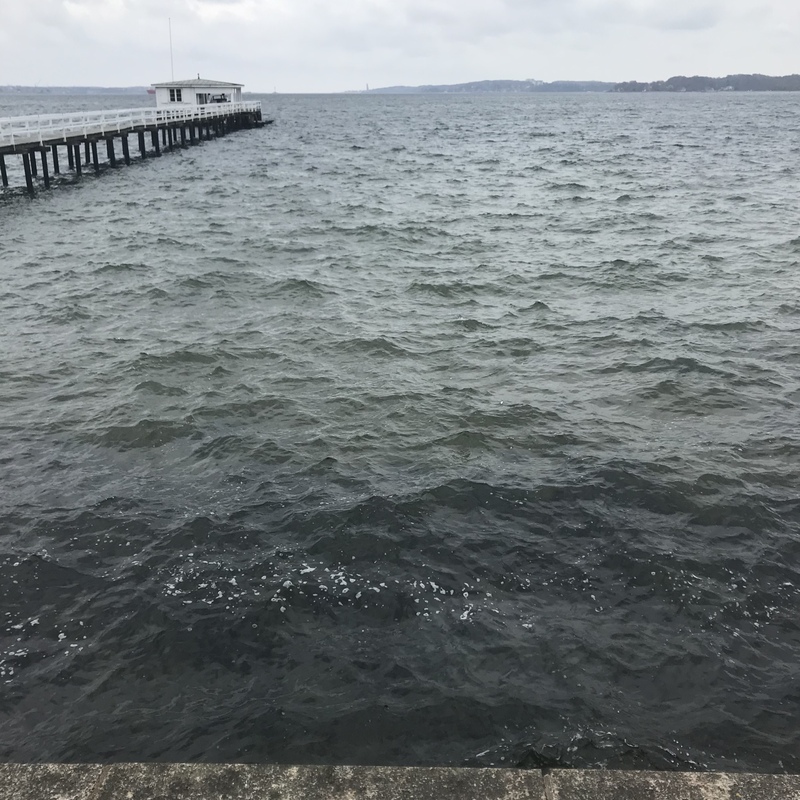 In that exact spot, the current velocity is clearly as large as the waves’ phase speed, so they can’t get away in either direction. A close second place is how smooth the turbulent current gets right before it plunges down the waterfall (see how the turbulence upstream looks like structures are more or less as long as they are wide, and then they become really long ellipses as they are accelerated towards the waterfall and the front is going faster than the back? ), and the submerged hydraulic jump (and check out the video in this post for another really cool one!). And I love how the water is boiling with turbulence below the waterfall — at least in the part in the front; in the back there is a lot less flow and a lot less turbulence. Isn’t it amazing how much there is to see in such a little bit of a stream? 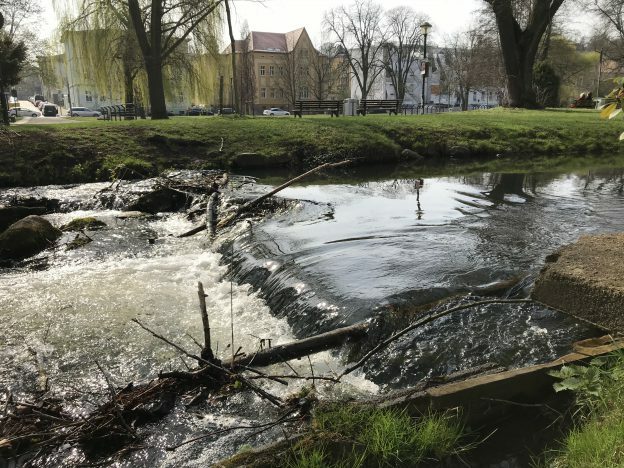 This entry was posted in wave watching and tagged Eberswalde, hydraulic jump, standing wave, standing waves, submerged hydraulic jump, waterfall on April 5, 2019 by mglessmer.